We are all aware of the cost to the tax system of Negative Gearing. That is only half the story. 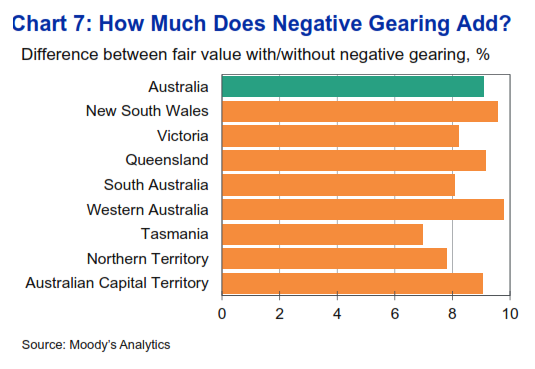 Moodys’ Analytics has today released their estimate of how much negative gearing inflates house prices in Australia. In Sydney where the ABS says established houses are a median $670,000, at least $64,000 of that is due to ‘gearer competition displacing homebuyers via price. Given Sydney is ground zero of ‘gearer displacement, this is likely a gross underestimate of the price consequences. ‘Gearer pressure elevates NSW prices by around 9.5 per cent, Victoria’s by 8.25 per cent and Western Australia’s by 9.75 per cent. Tasmania is fortunate in ‘Gearing only elevating prices by a mere 7 per cent. So, not only are citizen taxpayers subsidising the little landlord strategy of converting taxable income into concessionally taxed capital gains, we also have to endure significantly higher housing costs. This cuts household incomes, and adds to the size of deposits, mortgages and interest payable for every homebuyer in Australia. Thanks, guys. Over recent years, the premium has varied a lot, peaking at 15.5 per cent in 2008, falling to a mere 7.5 per cent a year later, rising to 14 per cent in 2012 and now resting at 9 per cent. 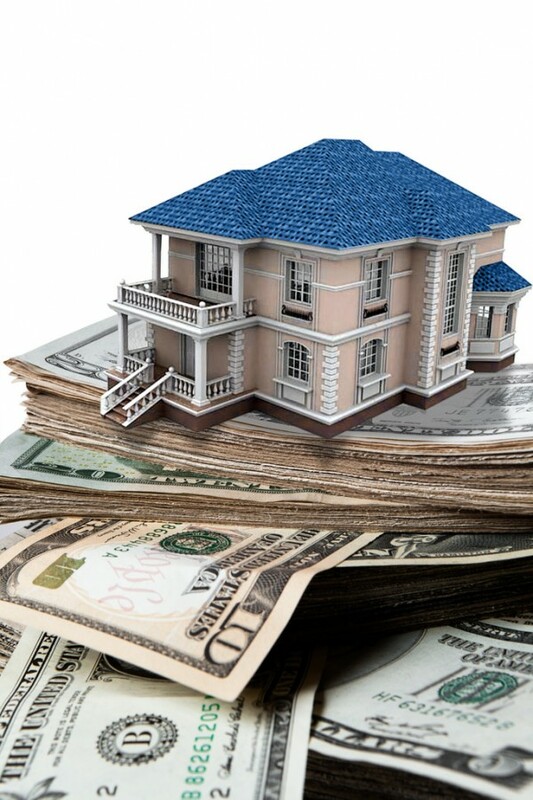 2008 and 2012 homebuyer cohorts now wrestling a fat mortgage have reason to be very, very angry. This presents a serious dilemma for policy makers. 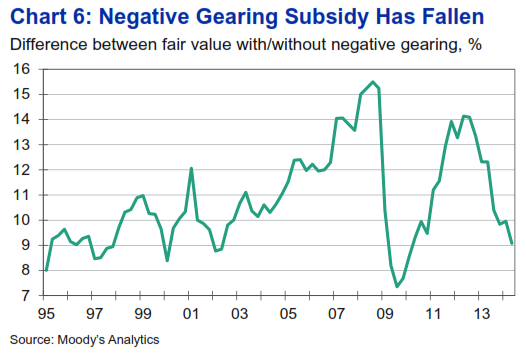 We can see Negative Gearing bleeds other households in at least two ways and should be stopped. A sensible reform would be to grandfather all existing ‘Gearers and limit fresh investment into residential real estate to new construction, so aspiring rentiers contribute to housing supply. However, removing ‘Gearers from the market for established houses would prompt an immediate price fall of 9 per cent and almost certainly a price snowball lower as buyers discover the magic of getting richer by sitting on their hands in a falling market. There is an army of spruikers, trolls and crawly critters ready to point warty fingers of blame for price changes on any policy move ever, anywhere. It is no wonder RBA Governor Glenn Stevens ‘jaw-jaw’ looks more like lock-jaw. The Great Australian Land Bubble cannot be burst by a human hand, for fear. We wonder at how bushfire takes out streets and households yet miraculously spares many among the innocent ruined. Mr Market’s radical solution will be eerily reminiscent and as tragic as Black Wednesday.